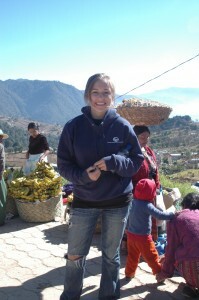 Dylan Kornegay in the San Francisco market outside of Xela. Between her last final exam and Christmas Day, Undergraduate Dylan Kornegay (Spanish ’12) traveled to Guatemala to accompany her sister who is working an an essay project on women’s health issues worldwide. During their hike through the Guatemalan mountains outside of Quetzaltenango (Xela), Dylan and her sister spent three days with indigenous families while learning about local customs, cuisine and daily life. The Kornegay sisters also devoted one week to a Spanish school in Xela where they studied Spanish and culture five hours per day. To conclude their trip, Dylan and her sister spent three days at Lake Atitlán, where they took painting classes from one of the local artists of San Pedro, Pito Cortéz. They also engaged in kayaking, swimming, cliff diving, mountain biking and hiking volcanoes, all in the interest of seeing and experiencing Guatemala. Professor Sarah Owens has accepted an invitation to discuss her book Journey of Five Capuchin Nuns as guest speaker of the Cathedral of St. John the Baptist Women’s Club on January 4, 2011. Professor Carrillo-Arciniega’s novel Los indomables has been accepted for publication by Editorial Praxis in Mexico. Angelina Phebus will present research at the annual meeting of the Archaeological Institute of America. A collaboration between herself, Dr. Newhard (Classics) and Dr. Levine (Geology), the presentation presents preliminary results of modeling communication routes in the Argo-Saronic region of Greece. Ms. Phebus is lead author of the work. The annual meeting of the AIA is the largest national meeting for Classical Archaeology in the United States. Abstracts undergo a process of peer review. Professor Ben Fraser’s article “The Ills of Aerial Photography: Latin America from Above” was published in the November 2010 issue of the journal Chasqui. The fall 2010 issue of The Portuguese Newsletter, a national publication of the American Association of Teachers of Spanish and Portuguese and edited by Professor Luci Moreira, is now available at http://www.aatsp.org/resource/resmgr/pn/pn_fall_2010.pdf. Kelly Smith (M.Ed. 09) has been awarded a Fulbright Alumni Grant to participate in a collaborative unit on Medieval Latin/Gregorian chants in Rome, scheduled for spring 2011. Ms. Smith will be also teaching advanced intermediate Latin in the spring 2011 semester. The South Carolina (Charleston) Society of the Archaeological Institute of America (AIA) has been selected to receive the AIA’s Society Outreach Grant in support of an archaeological conference to be held at Charles Town Landing in February 2011. Only a handful of these grants are awarded in a given year. The initiative is the result of collaborations between Scott de Brestian, Jim Newhard, and Tessa Garton of the South Carolina Society and Cicek Beeby of Charles Towne Landing. The Archaeological Institute of America is the largest professional/avocational organization in the United States, dedicated to promoting understanding of the world’s cultural heritage. Local societies, found throughout the United States, support local initiatives and cultivate interest in archaeology at both the local and global level. The public lecture series sponsored by the South Carolina Society is free and open to the public. “El drama fundacional del mexicano: De indios, pelados, pachucos, enmascarados y accidentados mestizos,” a book chapter by Professor Raúl Carrillo-Arciniega, has been published in Conciencia mexicana. by Céfiro Press of Texas Tech University. Ms. Christine Weisglass, Spanish major and Linguistics minor ’07, will see her article “An Acoustic Study of Rhotics in Onset Clusters in La Rioja” appear in the selected proceedings of the 40th Linguistic Symposium on Romance Languages. Christine is currently a Ph.D. candidate in Spanish with a focus on Hispanic linguistics at Florida State University. Ms. Melanie Keller, Spanish major and Linguistics minor ’10, will present her study “Queer Linguistic Activism: Arriving at a Course of Action” at the Southeastern Women’s Studies Association Conference on March 24-26, 2011.